This is an easy 3-Ingredient Pancake recipe made quickly with ingredients you already have at home for a delicious weekend breakfast. I’ve tried my fair share of wheat-free, dairy-free, 3-ingredient even 2-ingredient pancakes before to know whether or not they actually work – and taste great. The 2-ingredient (egg and banana) recipe can be finicky at times and not always yield great results. But with these ingredients there’s no messing around. 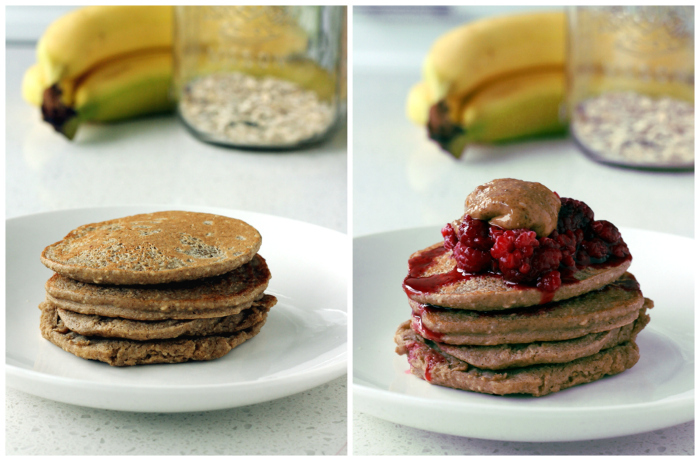 I assure you – the 3-ingredient vegan pancake worked the first time, and will work every time. They won’t fall apart, no sticking to the pan or turning to mush. They taste great with no added sugar, eggs, flour or baking soda/powder. You can make them in minutes with ingredients you’re sure to already have at home. These little 3-Ingredient Pancakes would be great for a brunch for your vegan and non-vegan friends alike. The original recipe makes enough batter for 4 regular sized pancakes – the perfect amount for yourself on a saturday or sunday morning when you’re craving pancakes but don’t need to make a large batch. You can easily double the recipe for two or triple it for more etc. Serve with fresh fruit or fruit compote by warming up frozen berries and pouring overtop. No high-sugar syrups needed here. I made my own oat flour by adding the rolled oats to the food processor and pulsing until a fine flour formed. Then simply add your banana and milk and process again until completely smooth. 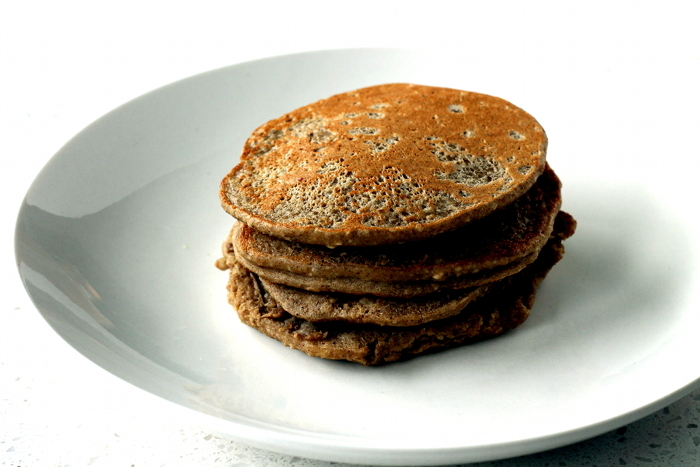 A super easy and quick no-mess vegan pancake recipe that yields thick fluffy pancakes. These pancakes will fill you up without filling you out. A healthier way for everyone to enjoy this favourite breakfast food. I made them two days in a row – and you’ll want to too because they come together so quickly! Heat a pan on medium heat. Add coconut oil or other vegetable cooking oil to the pan. 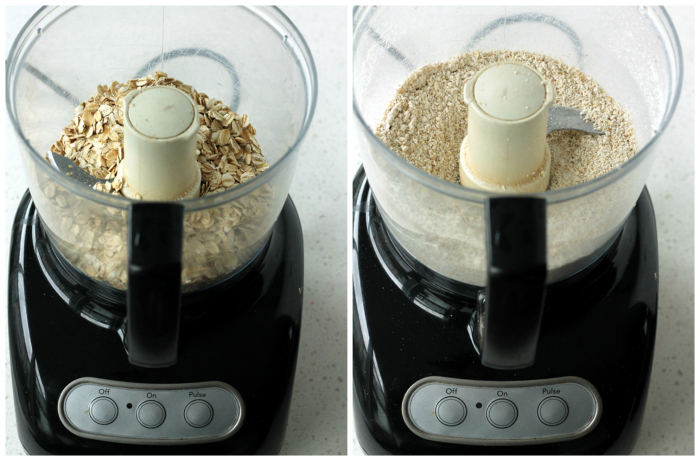 If making your own oat flour: Pulse the rolled oats in food processor until fine flour forms. Once oats are pulsed and ready add in the 1/2 banana and 1/2 cup milk or water and pulse again until smooth batter forms. 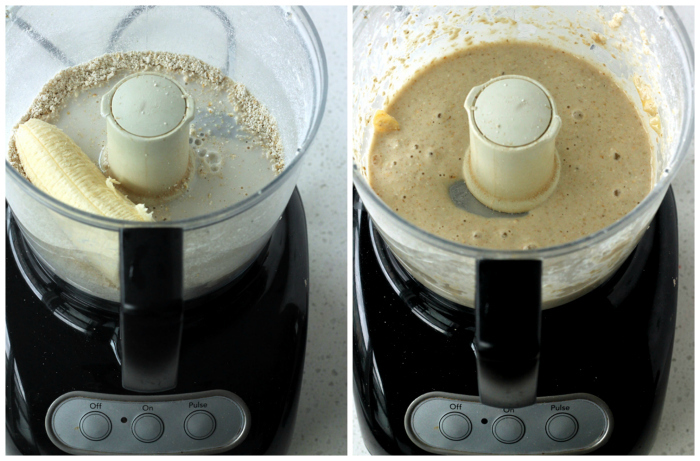 If you’re using pre-made oat flour you can use a hand-held blender to beat batter, a whisk will also work. Using 1/4 cup measuring cup add pancake batter to prepared pan and cook 2-3 minutes before flipping. Cook additional 2 minutes on other side. Serve with fresh fruit or other toppings such as coconut, dried fruit, nuts, nut butter etc.